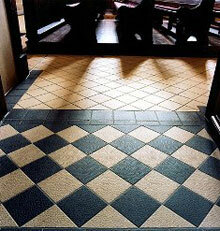 Fine stoneware floor square tiles for reconstruction of historical floor in heritage church. Reconstruction of old flooring from the late nineteenth and early twentieth century, made ​​using replicas of historic square tiles. Platelet surface is modified (so-called "spider web"). Tiles made ​​from dyed in the mass of stoneware, a high precision rate (dry pressing), which allows stacking them on the minimum grout. Replicas of antique art nouveau tiles made ​​of vitrified clay are very fine high resistance to abrasion. And the minimum absorption (<0.5%) for slip resistance class - R10.